News Big Band Dance Tonight! 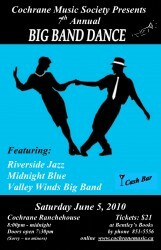 Shine up your dancin’ shoes for a night of big band swing, jazz, Latin, classic rock, and maybe even a polka or two. Featuring Cochrane’s own Riverside Jazz, along with Calgary’s Midnight Blue and Canmore’s Valley Winds Big Band. Dance from 8pm to midnight (doors open 7:30) with a cash bar, free snacks, and comfortable tables to rest up between dance sets. Join us at the Cochrane Ranchehouse tonight, and be sure to bring a few friends! Tickets are $21 and, as of 5 pm today (June 5) are now only available at the door. This is a licensed event, so sorry, no minors.